Rick Parfitt Jnr. showed his class in the four-hour BMW Endurance Challenge race at Daytona, battling his way through the opening stints of the race in the top six. The Nottingham-based driver started the race from fourth on the grid as the cars crossed the line to start the 240-minute epic. He lost out in the opening laps, dropping down the order as cold tyres prevented him from attacking in the same way as his rivals. 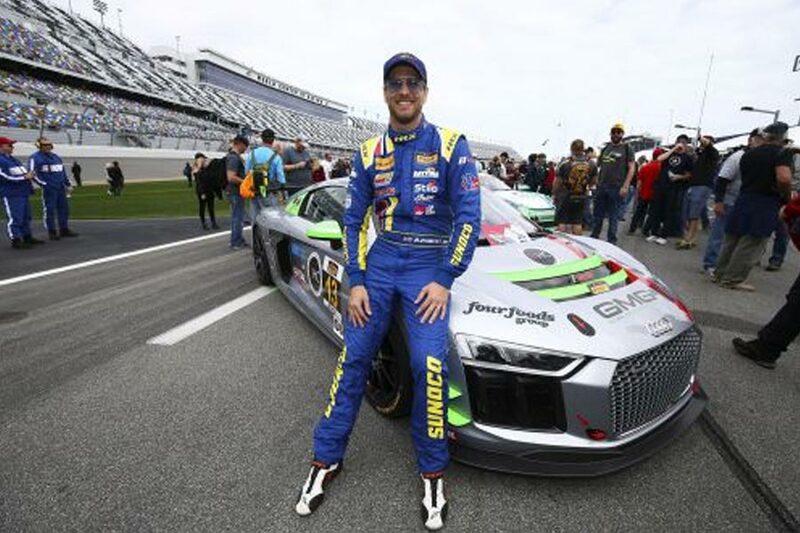 By the forty-minute mark a Full Course Yellow period was declared after a car spun on the back straight, allowing Rick to pit the Audi from tenth place. The new rubber clearly suited the British GT Champion as, when the track went green, he vaulted up to fifth place, just behind the leading gaggle of cars. After a strong second stint the car spluttered to a halt on the back straight having run out of fuel. The team were able to recover the car to the pits, allowing Darren Jorgensen to take over driving duties after the car was refuelled. Pro driver Cameron Lawrence jumped in to finish the race in 27th place but it was definitely a case of what could have been. The pace was clearly in the car and drivers but Rick can be satisfied that he did and outstanding job on his US racing debut. “At the beginning I just got mugged, I had no grip. All the way through you could just see in the mid corner to exit it just didn’t have the bite that the Mustangs have. We can go through the twisty stuff better, and I can really get them on the brakes by stepping it on its nose and getting around. “I was running consistent low 1:58s which was pretty quick but it’s a very tricky car, very snappy, so I had to be careful with it. I was just trying to keep it as tidy as possible, I didn’t feel that I could be aggressive with the car. I could do very good, consistent laps but to go on the offensive we needed that extra bit of bite on the car, so I could pull people in and out-brake them. The Mustangs could do that, and I couldn’t get the power down to match them. “It was a good debut, two Audis in the top six so that’s good going and for me, a 43-year old singer from the UK, to be going quicker than the young factory drivers I’ve got to be fairly happy with that.